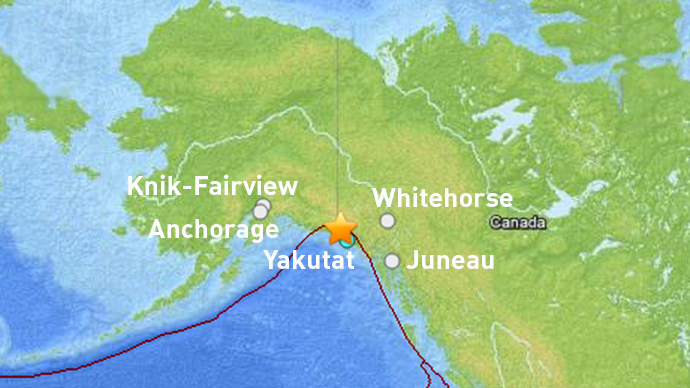 A 5.8 magnitude earthquake has hit some 95km northwest of Yakutat, Alaska. The tremor hit at a low depth of 600 meters, according to a preliminary USGS estimate. The epicenter is located just inside Canada’s Yukon on the border with US’ state of Alaska. The borough of Yakutat stretches along the coast of Gulf of Alaska. It has a population of 662, according to a 2010 census. No immediate reports of casualties or damage from the quake was available.